The dress she arrived in told it all. 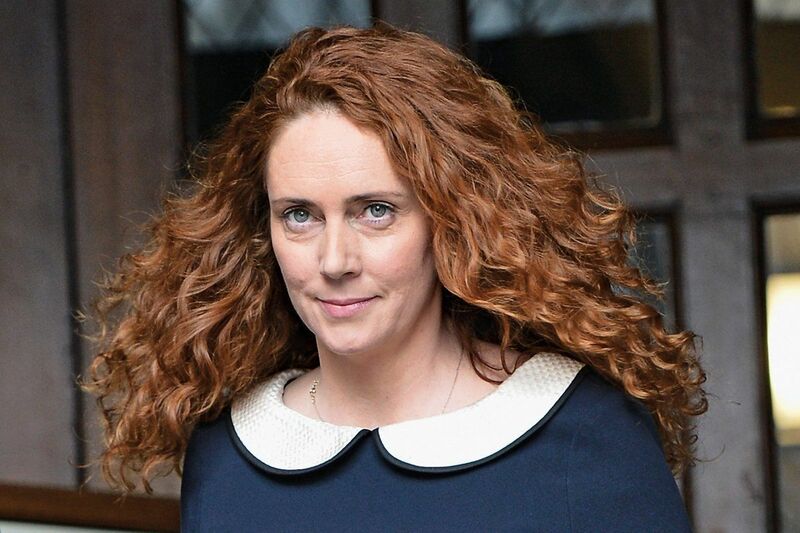 When Rebekah Brooks, former CEO of News International, posed on the steps of the Royal Courts of Justice two weeks ago, it was a red-carpet moment. The Leveson Inquiry into press standards taking place in London had already become the best show in town, with a glittering cast including Hugh Grant, Sienna Miller, and James and Rupert Murdoch—but Brooks was bound to take the starring role. Presumably her lawyers had helped her with her lines. And her outfit would have been discussed with her PR adviser from Pottinger Bell, a company that has represented a host of potentates and their kin, including the first lady of Syria, Asma al-Assad; the deposed president of Yemen, Ali Abdullah Saleh; and the late Chilean dictator, Augusto Pinochet. When the fallen Queen of Fleet Street turned up in a simple $800 black dress with a white Peter Pan collar, it was the carefully crafted image of maligned innocence. Four days later, in a less polished performance, after she had been charged with three counts of perverting the course of justice, the victimhood strategy was still in place. Standing outside the offices of her lawyer, Brooks looked shaken. “I am baffled by the decision to charge me,” she said. Her husband, horse trainer Charlie Brooks, also arrested on two counts for allegedly hiding evidence from police, gallantly stepped forward. “I feel today is an attempt to use me and others as scapegoats ... to ratchet up the pressure on my wife,” he said, “who I believe is the subject of a witch hunt.” Suddenly that Peter Pan collar took on another dimension. The satirical magazine Private Eye immediately picked it up—it was 17th-century Salem, with Brooks as Goody Proctor in The Crucible. Last week in Cannes, it was announced that she was about to get the film treatment. For Brooks, out on bail but still being investigated, aggressive victimhood has become the core of her legal case. Brooks’s lawyer, Stephen Parkinson, a specialist in human rights, maintains that because “so much prejudicial material has come into the public domain,” it is impossible for his client to get a fair trial in England. But a fair treatment was rarely afforded those who landed in her pages. Brooks was one of the youngest editors of the world’s best-selling English-language News of the World, and presided over the paper while phone hacking was rife. During her reign, the paper pursued victims aggressively for headlines, particularly for stories involving pedophilia, child murder, and child abduction. The obsession with such stories led one of her employees to hack the cellphone of murdered schoolgirl, Milly Dowler, in 2002. The exposure of this intrusion by The Guardian newspaper last summer shuttered the Sunday tabloid, and Brooks’s reaction to the closure of the 168-year-old paper was telling: as she told a gathering of journalists who had been fired—she was a victim, too. After editing News of the World, Brooks became the first-ever female editor of the bestselling daily tabloid The Sun, which likewise thrived on celebrity scandals and salacious political exposés. Brooks complained to Lord Justice Leveson that much of the coverage about her was “gender-based” but by then the inquiry had heard plenty of other testimony: from the actress Sienna Miller, who had been pursued down the street by a pack of paparazzi and who thought her family had betrayed her because her phone was hacked; from the singer Charlotte Church, whose teenage boyfriend was offered hundreds of thousands of dollars for a kiss-and-tell, and whose mother was forced to tell Brooks’s tabloids about her suicide attempt, in part prompted by the News of the World’s exposure of her husband’s affair; from Gordon and Sarah Brown, who Brooks had called herself, telling them to go on the record about their 4-year-old son’s cystic fibrosis, because she was running the story on the front page of The Sun. Even Brooks, whose career was premised on privacy invasion, had to admit to the lead counsel of the media ethics inquiry, Robert Jay QC, that it was the “height of hypocrisy” to complain of being under the spotlight. For Brooks the personal and political have long been indistinguishable, as she implicitly acknowledged when she observed that her relations to Rupert Murdoch and senior British politicians were “gossipy” and “personal.” During the late ’90s, she came to know the family through Matthew Freud, the PR scion, and his wife, Elisabeth Murdoch, Rupert’s daughter. Rapidly promoted by Les Hinton, one of Rupert Murdoch’s longest-serving lieutenants, Brooks became almost a family member of the media dynasty, working in tandem with James Murdoch when he launched the ill-fated $12 billion takeover of the lucrative satellite broadcaster BSkyB—his project to cement his status as heir. confidenceThe victim strategy might still work. For all her ruthlessness toward others, Brooks nevertheless displays a redoubtable ability to charm even would-be foes. Gordon Brown still turned up when she married Charlie Brooks, though her paper had painfully exposed his son’s medical condition. Even Rupert Murdoch, on the weekend he shuttered his first big foothold in the U.K. newspaper market, the News of the World, was more worried about his protégé’s confidence than the 200 journalists he had just sacked. These days, though, Brooks can’t dictate the headline—and neither investigators nor courts are moved by self-pity. Though Brooks gave birth to a baby girl via a surrogate early this year, she is scheduled to appear in court on June 13, alongside her husband, her former assistant, her former chauffeur, and her former head of security. She faces a lengthy trial and possible jail time, and that’s just for the offenses she’s been charged with so far. Three major police investigations have been launched to look into alleged criminality at the two tabloids she used to edit. Though Britain has no explicit plea-bargain system, cooperation can be taken into account during sentencing by the presiding judge. But with a reported $3 million severance package from News International, plus the use of a chauffeur-driven car and a Mayfair office, the urge to stay loyal to her employer must be high. As a source close to the family told Newsweek, “When you’re facing charges, your loyalty is tested.” Her loyalty will indeed be tested, but Brooks is a wild card, capable of immense compassion, particularly for herself. Which leaves the question: how long will she play the martyr?